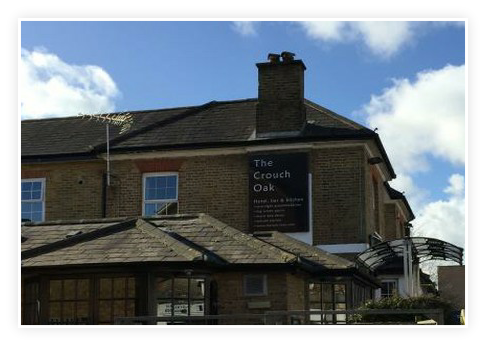 You are assured of a warm welcome when you visit The Crouch Oak with its friendly atmosphere in pleasant surroundings. Located just a short walk away from Addlestone railway station our accommodation offers a 'home from home' feel with tastefully decorated single, double and twin rooms available, all equipped with digital TVs and tea & coffee trays. We have a large and inviting bar lounge with a great selection of beers, wines, spirits and bar snacks, WI-FI, big screens and regular live entertainment on the weekends. You will also find a tempting menu of competitively priced home cooked food. We have easy access to and from main roads and the M25, car parking is available for residents free of charge. We are also very close to Bourne Business Park and Aviator Business Park, plus Thorpe Park, Brooklands, Windsor, Legoland and Heathrow Airport.